Here are the best Costa Rica beaches, attracting tourists from all over the world. All of the most popular beaches are located on the Pacific Coast, and range in color from soft white sand to black volcanic. Playa Manuel Antonio is known as one of the most idyllic Costa Rica beaches, attracting tourists from around the globe. 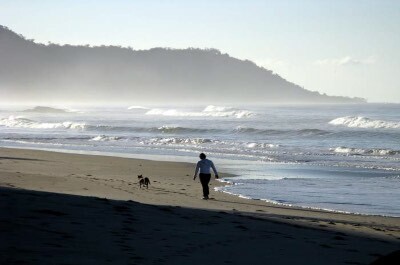 This white-sand beach is located on the western coast in Puntarenas Province and is one of three beaches in the area. Playa Manuel Antonio lies inside the Manuel Antonio National Park. A limited number of only 600 visitors per day are allowed access to the Park, if you are visiting during the peak tourist season, make sure you come early. The other two Costa Rica beaches close by have public access. The first is Playa Espadilla Sur which offers great surfing waves on the north end and smaller waves on the south end, ideal for swimming. The second public beach is Playa Biesanz which is a perfect spot for snorkeling. 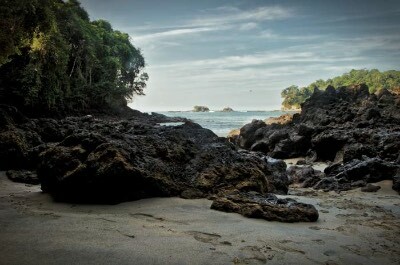 Playa Manuel Antonio is accessed via walking trails through the rainforest. There are an abundance of things to do at Playa Manuel Antonio. Visit the delightful town of Quepos, it is a 4.5 mile drive from the beach by bus, taxi or car. Enjoy the laid back vibe, stroll around the quaint markets and find a hand made souvenir. Relax at a street cafе, order a traditional casado and watch the people. The small village centre at this Costa Rica beach also offers a selection of shops and vibrant street vendors happy to bargain with you. Get pampered at the Terra Spa, where a professional massage will make you feel like a new person. Water sports lovers can surf, scuba dive and snorkel at this Costa Rica beach. For the family, there are riverboat safaris and banana boat trips. For the brave, you can join a ziplining, whitewater rafting or jet ski experience. Looking to catch the big one? Fishing in these waters is superb all year round. In the Manuel Antonio National Park, you can hike along the scenic trails with a professional nature guide to get a peek at rare rainforest creatures. Learn about the wide variety of wildlife, bird life and flora. Hikes range from easy for all ages to more difficult with steeper inclines for the fit. The hotels at Playa Manuel Antonio are magnificently placed on the high hill that runs from the Playa Manuel Antonio Costa Rica beach to Quepos, with spectacular sweeping ocean views. Find luxury accommodation at the fabulous Arenas del Mar Resort and the Parador Resort. For mid range priced accommodation, we suggest the Falls Resort, Byblos Hotel and the Shana Hotel. If you are on a budget, the Babaloo Inn is a very affordable option. This beautiful Costa Rica beach - Playa Manuel Antonio is the main attraction. It is uncrowded with lots of space, endless white sands, azure blue water and small waves ideal for all ages. Spend lazy days soaking up the sun, swimming, walking and relaxing. Bring along your picnic basket but watch out for raccoons and monkeys who may want to share! As evening falls you will be treated to the most magnificent sunsets over the ocean. 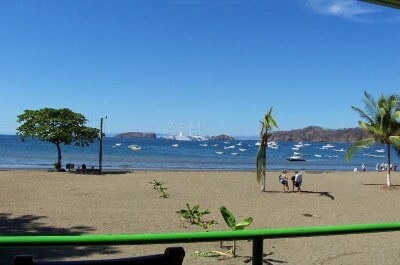 Tamarindo in the Guanacaste Province was originally a quiet fishing village. After the expansion of the nearby Liberia International Airport in the middle 1990s, tourists discovered this slice of paradise and started flocking here for their vacations. 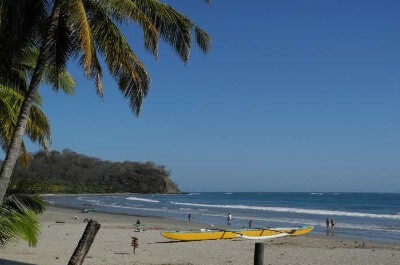 Today Tamarindo Beach is one of the most popular Costa Rica beaches. It offers a large selection of accommodation, a busy town with restaurants, bars and discos and a host of activities to keep you entertained. Tamarindo is young and fun and happening, if you are looking for laid back and relaxed, this is not for you! 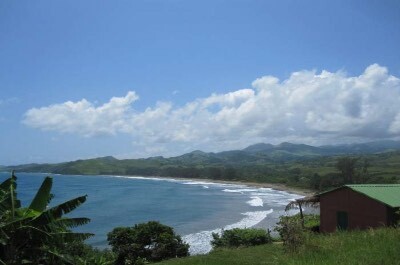 This popular Costa Rica beach is a surfers paradise with stunning scenery and perfect waves. In fact, Robert August, one of the stars of the classic surf film, Endless Summer, has made Tamarindo his permanent home. 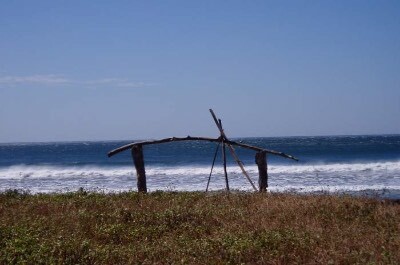 The layout of the beach is long and rocky with excellent surfing waves near the mouth of the estuary. For swimmers, the currents can be strong, so set up on a beach towel and watch the professional surfers! 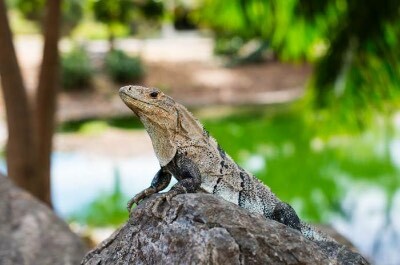 They can be found at Pico Peque–o, a rocky point near the Hotel Tamarindo Diria and at El Estero opposite the Cabinas Tsunami. If you are a beginner surfer the rest of this Costa Rica beach is ideal for learning, take a few lesson and try out your skills. 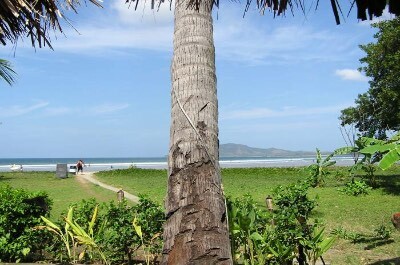 Water sports lovers can also enjoy body surfing, scuba diving and snorkeling at Tamarindo beach. If you enjoy nature, there are kayak tours of the estuary which boasts a marvellous selection of flora and fauna as well as amazing scenery. For those wanting a rush of adrenaline, try some zip lining or white water rafting. For something more relaxed, watching turtles is a great experience. The town is surrounded by the Las Baulas National Park which is world famous for its work done in protecting the endangered Leatherback sea turtles that come to nest on Playa Grande. Hotels in Tamarindo range from luxurious to budget. On the upper scale we suggest the magnificent Los Altos de Eros with stunning views, a pool overlooking the Pacific ocean and a world class wellness center. For medium priced accommodation, try the Hacienda JJ for its quaint ambiance set amidst luscious tropical gardens. Enjoy a spa massage treatment in the town, eat freshly prepared seafood and sail on a luxury catamaran sunset cruise to end your day. 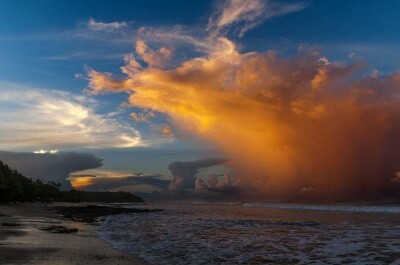 Facing due west, the sunsets on this Costa Rica beach are some of the most spectacular on the planet. Looking for a Costa Rica beach with a Reggae vibe and a great local surfing community? Jaco Beach in Puntarenas Province is the place to be! But don't think this is an underdeveloped town - it has its full share of hotels, restaurants, bars and entertainment. Jaco is also referred to when speaking of the entire Central Pacific region. It incorporates the towns of Hermosa, Esterillos, Herradura and Punta Leona and is home to the Los Suenos Resort & Marina. In this area there is something for everyone to explore. Jaco Costa Rica beach is a surfers paradise with huge waves, endless golden sands and panoramic views. You can also enjoy snorkeling, body boarding and scuba diving. If you want to learn surfing there are an abundance of surf camps where you can have private coaching lessons or sign up for fun group and family day packages. Inland are tropical forests with ziplining adventure courses, white water rafting, horse riding, hiking and walking tours. Sports fishing offers the opportunity to catch that big one and kayaking allows you to explore the waterways with a guide on a relaxed trip. Enjoy a fabulous sea food cuisine at El Hicaco Restaurant and a great icy gelato dessert at the Marsican Gelato Lounge Restaurant. Upscale accommodation around this fabulous Costa Rica beach can be found at the Los Suenos Marriott Ocean & Golf Resort known for its luxurious ambiance offering all the amenities you require. For a more rustic vibe try the secluded villages in Esterillos. If you want to explore the region, head north to Herradura where you will find a beautiful cove style beach, perfect for a romantic picnic. Admire the rivers flowing into the bay and then continue to the beautiful colonial style Hotel Villa Caletas, perched high on top of the mountain. Watch awe-inspiring sunsets while sipping an exotic cocktail. Don't leave Jaco without exploring the Tico Pod Art House & Gifts store. It features a great selection of Costa Rican Art and handicrafts. You will also find beautiful ceramics, wood carvings, silver jewelry and local Indian Masks. Coffee addicts must visit the Costa Rica Coffee Experience, where you can sample different coffees from this famous region and learn how coffee is made. Known as one of the most beautiful Costa Rica beaches, Playa Flamingo must be on your list of stop over venues. It is located on the Gold Coast, in Guanacaste Province in Punta Salinas, north west of Bahia Brasilito. This beach is known for its world class deep sea fishing, with luxury fishing charters departing regularly from the large Marina. Sail with a professional team and catch marlin, tuna, swordfish and snapper. In July, the beach hosts the international sailfish tournament sponsored by the Costa Rican Amateur Fishermen's Club. Scuba diving in the crystal clear waters offers an abundance of marine life and rocky reefs to explore. Take a walk on the Playa Flamingo Costa Rica beach and explore the tidal pools, they are filled with a myriad of colorful sea creatures and plants. If you prefer to be on the water, enjoy a dolphin or whale watching tour with a knowledgeable guide. Head inland and try your hand at river rafting or tubing Ð a great family bonding experience. Playa Flamingo does not have a village center. It is mostly surrounded by luxurious and exclusive beachfront resorts and homes belonging to the rich and famous. You can travel to the town of Brasilito or beyond if you enjoy exploring. This little town has all the charm of a Costa Rican village with wonderful sunsets and ocean front dining. Play a round of golf, try a crazy ATV tour or horse ride down the coast back to Flamingo Costa Rica beach. For nature lovers, not far away is the Marino Las Baulas National Park, 450 hectare region of mangrove swamps, rivers and coastline. This Park is known for its protection and study of the endangered Leatherback Turtles who come to nest here annually. Take a tour and learn all about these fascinating creatures. Accommodation is exclusive and luxurious. Stay at the beautiful Flamingo Beach Resort & Spa, it offers upmarket amenities and stunning views of the ocean. Eat at the Surf Box, you will love the laid back vibe and the owners will personally make sure you enjoy a scrumptious breakfast or lunch. Our next recommended Costa Rica beach for a vacation is the stunning Samara Beach. It is wide and long with shallow, gentle waters, small waves and soft white sand. Never too crowded, it is safe and ideal for a family with children. Samara beach also offers a superb coral reef where divers and snorklers can view magnificent colorful marine life. Enjoy a swim, soak up the sun and then head to Luv Burgers for a scrumptious meal. The small waves make this the perfect Costa Rica beach to learn how to surf - take a few lessons and up your skills! Samara Beach also has its own picture-perfect and totally deserted wooded island a short distance away in the bay - Isla Chora. Take a kayak and row out with a guide to this little piece of paradise where you can escape for a day. The snorkling is great and your guide will give an insight into the natural life of the region. When you come back, join a turtle watching or dolphin spotting tour. Located near to Samara Costa Rica beach is a wide choice of hotels, B&B venues, private homes for rent, restaurants, bars and discos. There is a choice for all tastes. For an exclusive upmarket experience, stay at the magnificent Hotel Villas Playa Samara. It features a swim up bar for a romantic occasion! On a lesser budget, the Villas Verdes offers beautiful tropical gardens and a relaxed vibe. The town backing Samara Beach is laid back and rustic with quaint shops and market vendors selling beautiful Costa Rican hand made crafts. Stroll around and enjoy the ambiance. Nature lovers can join a tour into the surrounding countryside and learn about the region, its history and cultures. If you are fit, explore the Samara Trails which wind their way around the Werner Sauter Wildlife Refuge. This Refuge covers over 340 acres in the tropical forest and has a huge abundance of plants and animals including monkeys, rare birds, mammals and amphibians. The hike takes about 3 to 4 hours to complete and is led by an experienced guide. For relaxation, you can be pampered with a massage at Laura's Beauty Salon & Spa and for fun, try a cooking class at the Tropical Garden Cooking School. When visiting the west coast, you will never run out of stunning Costa Rica beaches to visit and Playa Conchal must be the next one on your list. This exotic beach takes its name from the hundreds of millions of tiny crushed conch shells that make up the sand, a unique feature rarely found on other beaches. The beach is located in the north of Guanacaste Province. Although it is a public beach, main access is via the Reserva Conchal Resort. You can also walk down from Brasilito Beach, a distance of about half a kilometer, or, you can access it via the road to Bahia del Piratas. Either way Ð you cannot miss a day in this paradise setting. Unlike many of the Costa Rica beaches, there is no village close by so come by car or if you want to stay for a few days, book in at the Conchal Resort or find accommodation in the town of Brasilito. 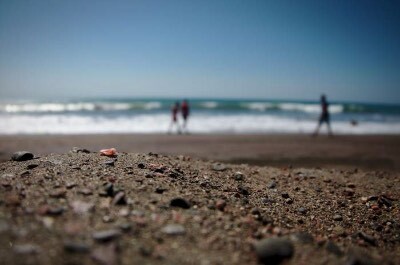 Once on this Costa Rica beach, you can swim, soak up the sun, walk for miles and collect a myriad of seashells. For the sporting types, snorkling will amaze you with the magnificent array of colorful marine life in the clear blue waters. For the more adventurous, scuba diving offers some of the best underwater scenery in Costa Rica. Then, get out your golf clubs and play a few rounds on the awe-inspiring Garra de Leon Golf Course, it is a short distance from the beach. This championship class course was designed by Robert Trent Jones Jr. and is known as one of the best golf courses in Central America. As you stroll along the greens, be awed by the breathtaking scenic beauty of the Pacific coast and the lush tropical inland jungle. Watch out for Howler Monkeys who might enjoy snatching your golf balls! For nature lovers, Playa Conchal is close to the Manuel Antonio National Park, where you can join a tour to learn all about their work preserving the endangered Leatherback turtles. Some areas of the Playa Conchal Costa Rica beach allow overnight camping, set up a tent, light a fire and sleep under the stars. What a way to make lifetime memories! Looking for the perfect surfing beach? Head off to Playa Avellana, one of the most renowned Costa Rica beaches. Located on the Guanacaste's Golden Coast, this beach attracts world class surfers with its 5.5m waves. Fondly known as "Little Hawaii' it is a meeting place for all things surfing, but still maintains a laid back and relaxed vibe. Endless white sands, crystal clear turquoise waters and gently swaying palm trees make this a tranquil little piece of paradise. Star of the Playa Avellana Costa Rica beach is Lola, a massive 400 kilogram pig who wanders around the beach and poses for photographs with locals and tourists. Make sure you get a selfie! A beach restaurant called Lola's Cafe, named after Lola, is one of the favourite hang outs after a day in the sun. Order an ice cold exotic fruit cocktail and a plate of freshly prepared sea food. If you want to explore, there is a little walking trail that you can follow. It is located a few hundred meters from the playa Avellana Costa Rica beach and leads into the forest, ending in a surprising beautiful deserted wetland. Also close by is the Las Baulas National Park. Here you can join a guided tour and learn all about the endangered Leatherback turtles and the work that is done to preserve them. The turtles come in their hundreds to nest on these beaches annually, creating an amazing spectacle. Stay at the El Sabanero Eco Lodge, a tranquil and luxurious resort where you can join a yoga class to relax! Also recommended is the upmarket JW Marriott Guanacaste Resort & Spa, with stunning ocean views and a spa to pamper and rejuvenate your body and mind. Looking for a young and fun vibe with sea, sand and sun? Head off to our next spectacular Costa Rica beach - Playa Santa Teresa. This trendy beach lies alongside the quaint coastal village where you will find restaurants, shops, entertainment and accommodation ranging from small hostels to exclusive 5-star luxury hotels. Stunning ocean views, endless white sands and an inland border of lush green jungle, make this an idyllic get-away venue. Surfing is the thing to do here and for beginners, it is the perfect Costa Rica beach to take a few lessons and up your skills. Many hotels offer surfing packages, lessons and camps. This beach offers easy-going breaks for beginners and massive high waves, ideal for the professionals - the best of both! Is you are not surfing, you can soak in a tranquil tidal pool, walk for miles and collect shells. The little town is packed with quaint stores along the main road where you can browse for handicrafts, enjoy freshly prepared sea food, sip a cocktail and soak up the ambiance. Then get ready for some adventure! Join an ATV tour and explore the inland jungle on a rugged and fun bumpy ride. If you prefer horse riding, enjoy a canter along the beach with a guide. Visit the picture-perfect waterfalls in Montezuma and nature lovers cannot miss exploring Cabo Blanco, Costa Rica's oldest Nature Reserve. Fishing enthusiasts must head to the neighboring community of Mal Pais and rent a boat with a crew of professional fishermen who will take you to catch the big one. If you prefer, simply sail across the waters and look out for mantra rays, dolphins and whales. For the fit, rent a kayak or canoe and explore on your own! The spectacular sunsets on Playa Santa Teresa Costa Rica beach make the night life vibrant and happening. Dance the Salsa and the Cumbia, enjoy the beat of Costa Rica as live bands play late into the night. Then head to the secluded and exotic Latitude 10 Exclusive Beach Resort where you can enjoy an outdoor pool and a spa treatment in total luxury. Nosara ranks in the top 20 beach surf cities on the planet, every reason to make this your next vacation destination. This idyllic Costa Rica beach known both as Playa Guiones and Nosara, offers perfect waves, clear turquoise waters, endless golden sands and an inland vista of lush green tropical jungle. A picture made in heaven! The waves are ideal for both beginners and professionals. Local surfing instructors are legends and are available to give you lessons and guidance. Learn balancing techniques, how to select the perfect wave, safety measures and more. Then soothe your mind with a yoga class on the beach! This community is world famous for its yoga schools, yoga camps and retreats. If you want to explore, head into the jungle near Nosara Costa Rica beach and join a horse riding tour with a knowledgeable guide. Try your hand at kayaking through the mangrove swamps and learn all about the flora and fauna of the region. For some adrenaline pumping action, zipline high over the forest canopy and see the most amazing scenery as you jump from platform to platform. Fishing charters leave from the coast, you can sail with a professional crew to catch striped marlin, yellowfin tuna, sailfish, mahi mahi, snapper and more. These waters offer some of the best sport fishing in the world. If you prefer not to fish, look out for dolphins, mantra rays and the massive humpback whales that live in these waters. When you get back to dry land, head to the famous Bakery where you can enjoy scrumptious blueberry pie, coconut chocolate pie and other delectable treats. Nosara Costa Rica beach boasts a choice selection of hotels. From small and cozy to palatial and super expensive there is a choice for everyone. Try the Moana which offers exclusive hideaway villas, each one beautifully appointed and tastefully designed. The Bodhi Tree is a Balinese inspired retreat paradise featuring a health and fitness haven for those who appreciate the finer things in life. Don't leave Costa Rica without spending time on Playa Guiones! Playa Hermosa is the perfect family vacation destination. This Costa Rica beach holds a Blue Flag or Bandera Azul status, an accolade given to beaches that maintain the highest environmental standards and offer world class safety facilities. The beach is located 7km north of Playas del Coco on the idyllic west coast. With a name that means "Beautiful Beach" what more can you ask for? It offers 2km of unique grey sand, crystalline clear blue waters and is surrounded by lush green tropical jungle and ridges of volcanic rock. The vibe here is relaxed and the beach is very seldom crowded. It makes a great get-away for those looking to rest, regroup and calm their minds and body on a Costa Rica beach. If you want to be active, enjoy swimming in the warm water, snorkeling to explore the amazing marine life or scuba diving for the more experienced. You can also choose to rent a fun kayak or canoe and paddle along the coastline. If you feel the need for speed, a jet ski or water bike will do the trick! There are a host of companies offering professional fishing expeditions and luxury catamaran sailing trips. Then, go inland to explore. A day trip takes you to the Arenal Volcano where you can try a therapeutic treatment in the hot springs. Closer to the beach, you can join a horse riding tour or a kayak trip into the mangrove swamps. Playa Hermosa Costa Rica beach is lined with hotels, restaurants, bars and entertainment venues. For a real splash out experience, book in at the Hotel Bosque del Mar Playa Hermosa, located on the beach. For something less expensive, the Villa del Sue–o offers rustic style rooms and a beautiful pool. For a fine dining dinner with sea views, visit the Abbocato Restaurant. For something more casual, head to the Backyard Bar Playa Hermosa Restaurant, where you will find a great selection of traditional Costa Rican specialities. Then plan an evening on the beach, facing due west, the sunsets are magnificent!